one of the many convolutions of the surface of the cerebral hemispheres caused by infolding of the cortex, separated by fissures or sulci; called also cerebral gyrus. angular gyrus one continuous anteriorly with the supramarginal gyrus. annectent gyri various small folds on the cerebral surface that are too inconstant to bear specific names; called also gyri transitivi. Broca's gyrus inferior frontal gyrus. central gyrus, anterior precentral gyrus. central gyrus, posterior postcentral gyrus. Cerebral gyri. From Applegate, 1996.
cingulate gyrus (gyrus cin´guli) an arch-shaped convolution situated just above the corpus callosum. frontal gyrus any of the three (inferior, middle, and superior) gyri of the frontal lobe. fusiform gyrus one on the inferior surface of the hemisphere between the inferior temporal and parahippocampal gyri, consisting of a lateral (lateral occipitotemporal gyrus) and a medial (medial occipitotemporal gyrus) part. hippocampal gyrus (gyrus hippocam´pi) one on the inferior surface of each cerebral hemisphere, lying between the hippocampal and collateral fissures; called also parahippocampal gyrus. infracalcarine gyrus (lingual gyrus) one on the occipital lobe that forms the inferior lip of the calcerine sulcus and, together with the cuneus, the visual cortex. marginal gyrus the middle frontal gyrus. occipital gyrus any of the three (superior, middle, and inferior) gyri of the occipital lobe. occipitotemporal gyrus, lateral the lateral portion of the fusiform gyrus. occipitotemporal gyrus, medial the medial portion of the fusiform gyrus. orbital gyri irregular gyri on the orbital surface of the frontal lobe. paraterminal gyrus a thin sheet of gray matter in front of and ventral to the genu of the corpus callosum. postcentral gyrus the convolution of the frontal lobe immediately behind the central sulcus; the primary sensory area of the cerebral cortex; called also posterior central gyrus. precentral gyrus the convolution of the frontal lobe immediately in front of the central sulcus; the primary motor area of the cerebral cortex; called also anterior central gyrus. gyrus rec´tus a cerebral convolution on the orbital aspect of the frontal lobe. 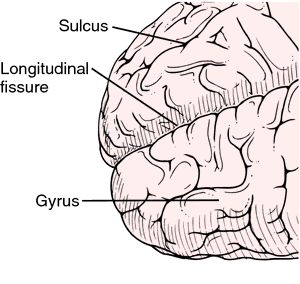 supramarginal gyrus that part of the inferior parietal convolution which curves around the upper end of the fissure of Sylvius. temporal gyrus any of the gyri of the temporal lobe, including inferior, middle, superior, and transverse temporal gyri; the more prominent of the latter (anterior transverse temporal gyrus) represents the cortical center for hearing. a relatively short horizontal convolution on the inferomedial aspect of the occipital and temporal lobes, demarcated from the lateral occipitotemporal or fusiform gyrus by the deep collateral sulcus, from the cuneus by the calcarine sulcus; its anterior extreme abuts the isthmus of the parahippocampal gyrus; the medial or upper strip of the gyrus forming the lower bank of the calcarine sulcus corresponds to the inferior half of the striate area or primary visual cortex and represents the contralateral upper quadrant of the binocular field of vision. A tongue-shaped gyrus that, at its anterior end (tip), abuts the parahippocampal gyrus on the under surface (ventral) of the occipital lobe. The calcarine fissure (calcarine sulcus) forms the medial (upper) edge of the lingual gyrus, and the collateral sulcus forms the lateral (lower) edge. Part of the primary visual cortex is found along the wall of the lingual gyrus inside the calcarine fissure. As anticipated, there were activations in the left PFMG, an area associated with word retrieval, and in the left lingual gyrus, the left parahippocampal gyrus and the left PCC, areas related to spatial cognition. The lingual gyrus and PCC collaborate with the parahippocampal gyrus in spatial navigation. Compared with the preoperative counterparts, the PA patients with improved visual results after the operation exhibited reduced ReHo in spots of the bilateral thalamus, globus pallidus, caudate nucleus, putamen nucleus, supplementary motor area, and left hippocampal formation, and increased ReHo in the bilateral cuneus gyrus, calcarine gyrus, right lingual gyrus, and fusiform gyrus [Figure 1]. sup] Consistent with these results, our study also identified increased ReHo in part of the LOC (fusiform), lingual gyrus and calcarine gyrus in patient with improved vision after the transsphenoidal surgery.